The difference between Chinese and Korean people, and their culture, is difficult to discern by other nationalities due to the fact that everyone sees the overall Asian appearance as a measure of origin. However, there are several noteworthy differences between the Chinese and the Koreans. Although they are both of Asian origin and their countries are part of the Asian continent, the two cultures are different due to their language, traditions, history and attitude to life in general. Physically, it is said that the two nationalities look alike. There are similarities, but apart from being Asian, these two sets of people do not look exactly the same. Chinese and Koreans are aware of their differences, but it is more difficult for outsiders to observe these differences. The Chinese and the Koreans are members of the largest and most populated continents in the world. Asia holds one of the largest collections of different cultures, including the Chinese and Koreans. Chinese people can differ physically according to the parts of China they originated from. The northern Chinese have paler skin, smaller noses and eyes and squarish faces compared to the Chinese people in the south. The Chinese culture is one of the oldest cultures historically and Chinese people honor their families and family traditions. The Chinese language is not easy to learn, although modern day Chinese has been simplified. The number of characters in use today are less than originally used. The spoken language relies on tones attached to words that are similar. The tones used differentiate the word meaning and this makes it more difficult to learn the language. Chinese people have traditional food and a unique way of eating with chopsticks. Their traditional dress called Hanfu was adapted from the Han people. Traditionally, being well dressed is a sign of wealth and success for the Chinese people. What are the unique aspects of the Chinese culture? The Chinese culture is one of the oldest in the world and although the Chinese are part of the Asian continent, they have preserved many aspects of their own culture. Writing Chinese is very different from other non Asian languages. The Chinese letters are called characters and each character is made up of a number of strokes. The strokes are performed in a specific order making this a complicated process to learn initially. Chinese is a difficult language to learn to speak due to the tones attached to different words. Tones, or emphasis on different sounds, may change the meaning of the word. Chinese food is unique in flavor and presentation and the food is eaten with chopsticks. There are some interesting social traditions that are still practiced today, like drinking tea. In many modern circles the tradition of bowing to greet people has relaxed into the Western style of a handshake. The Chinese are very hard working people. 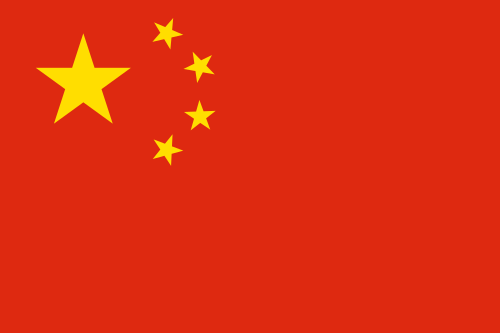 Economically, China has succeeded in climbing to second place, after America, on the GDP economic list. Korea is one of China’s neighboring countries and would appear to have adopted aspects of the Chinese culture. Both countries are classified as belonging to the Far East. It is the opinion of some Chinese people that the Koreans stole the Chinese culture and have adopted many Chinese customs. Koreans like to stick together and value politeness and family loyalty very highly. The Korean family tends to be a traditional family unit with the mother staying at home to raise the children. Koreans are light skinned and have a youthful appearance that they rate highly as a sign of beauty. Their noses are longer than the Chinese and they also have high cheek bones. Koreans choose to learn either Chinese or Japanese as part of their education. Koreans have their own handwriting system, also based on strokes, but not as complex as Chinese. The spoken language does not rely on tones and this makes it easier to learn. However, grammatically Korean is more difficult to learn, due to grammar structures. Koreans enjoy bright clothing and love to wear the latest name brands. Koreans are very conscious of their youthful looks and plastic surgery is sought after by young Koreans, as well as hair dying. What are the unique aspects of the Korean culture? 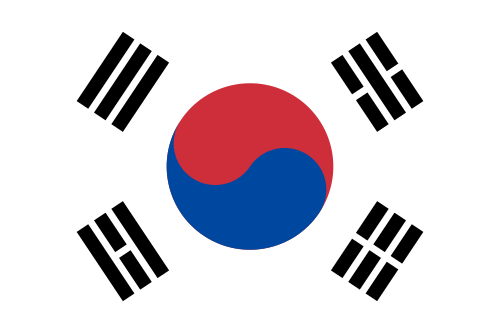 Korea is classified as part of the Far East due to its geographical position on the eastern side of the continent of Asia. Koreans are generally a shy nation and they are polite, peaceful people. The Korean language appears similar to the Chinese because it follows the use of strokes to make up characters. However, the handwriting is an easier system to follow and the spoken language, without tones, easier to learn. Grammatically Korean is more challenging. Koreans are conscious of appearance and wearing modern trends of clothing. They love to uphold brand names. Koreans eat with chopsticks, but use a metal variation of the traditional chopstick. In spite of being a smaller country than China, and a relatively new country to world markets, Korea has managed to reach 12th place on the GDP economic list. Koreans also take cultural cues from Japan and have continued to bow as a form of greeting, as the Japanese do. South Koreans are very competitive and after the war that affected both the North and South Korea, it was the South Koreans who entered the economic market place just a few decades ago. It is quite difficult to tell the difference between the two nationalities because there is often a mixture of inherited characteristics, along with the typical Asian look, that people recognize. Generally speaking Koreans have light smooth skin, smaller eyes and longer noses than the Chinese. They are very conscious of their youthful appearance. The Chinese have rounder faces and their skin tone varies depending on the area they originated from. Both Chinese and Korean people have the characteristic slanting Asian eyes known as mono-lids. Mono-lids are a single eyelid closing over the eye without a crease in the middle. This is a typical Asian facial feature. The Chinese culture has evolved from many different Chinese dynasties and cultural influences. Food, clothing and rituals like tea drinking are all associated with the Chinese culture. The Korean culture is not historically as ancient as the Chinese. Some observers say the Koreans have adopted a Chinese influence into their culture. There is an obvious difference in the spoken language because of the Chinese use of tones for different sounds attached to the same word. Another telling sound difference is the sound of the letter R, the Chinese language does not use this sound. Chinese people struggle to use the sound of the letter R. Although the Korean written language is also based on symbols it is easier to learn as there are less symbols or strokes to each letter. Many ancient customs and traditional styles have been incorporated into modern clothing to create an Eastern look. Mandarin collars and kimono style gowns and traditional patterns on silk are characteristic of Chinese clothing. The Koreans have been accused of copying many Chinese cultural traditions, but they too have evolved their own styles of fashion as they adopted the Hanbok style of clothing. All these fashion styles have a modern flare while keeping traditional lines. Both cultures have successful economies and have made their mark in the international trade scene. East Asian due to the geographical situation of their countries. The written and spoken language of both the Chinese and the Koreans is difficult to learn however, Korean is easier to speak than Chinese. Many eastern dress cultures and traditional ways of living are part of both cultures and gives them a strong association with Eastern Asia. Although these cultures are difficult to tell apart by westerners both the Chinese and the Koreans are very aware of their individual differences and cultural heritage. Christina Wither. 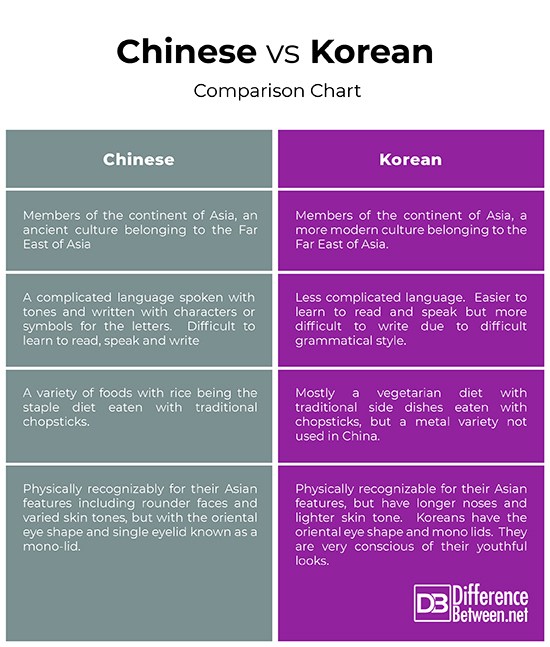 "Difference Between Chinese and Korean." DifferenceBetween.net. March 5, 2019 < http://www.differencebetween.net/miscellaneous/politics/difference-between-chinese-and-korean/ >. Koreans are not “mostly” vegetarians. I eat even more meat when I’m in Korea. They have a greater interest in vegetables for their side dishes, that doesn’t make them vegetarians. Kim Hya Tae 2015.comparing economical development.www.spark.parkland.edu.ah.national accounts at a glance.pub.OECDParis.